Jim and Lilian perform at Nichols Park in Hyde Park, Chicago, Fall 2004. 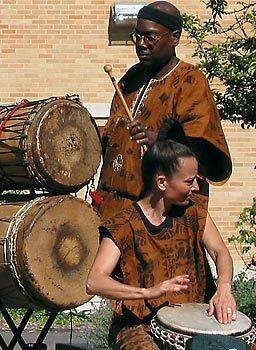 Building on a combined 20 years of training, performance and teaching experience in the Malinke djembe drumming tradition from Guinea, West Africa, The Chicago Djembe Project has offered intensive workshops, youth programs and performances in Chicago since 1999. Through its own work, and the Master Teachers it has brought to the city, CDP has been a catalyst in substantially raising the level of djembe practice and performance in Chicago. CDP were the North American Representatives/Contacts for Master Drummer Famoudou Konaté from 1999 to 2004, organizing his highly successful annual Mini-Camp Workshop Tours. CDP also introduced Chicago to Mamady Keita, sponsoring his Chicago workshops from 1999 to 2002, and helped establish Master Dancer Moustapha Bangoura's career in Chicago with his first workshops here in 1999. Respect and cooperation across cultures and genders through the African Djembe Drum Tradition. Announcing Hooked On Drums:™ Bringing the Life-Changing Power of African Drums to Urban Youth. Hooked on Drums is CDP's new partner organization, HOD is deeply committed to teaching African music as a vehicle for fostering creativity, curiosity, discipline, self-confidence and well-being in youth—above all, inner-city, at risk youth. founded and directed by Lilian. St. Paul, Minnesota, New Year's Eve 1998. One of the first non-African students of Les Ballets Africains legend and Malinke Master Drummer Famoudou Konaté. One of the first and finest Djembe drummers and teachers in Europe in the mid/late-80s. 16 year career as a Djembe soloist, group leader and teacher in Europe and the U.S. Studied and/or performed with Konaté, Soungalo Coulibaly, Alseny Camara, Paul Engel, Silvia Kronewald. Travel, study and participation in traditional Malinke festivals in Guinea, with Konaté. Created performing groups and educational programs that introduced the Traditional Malinke repertoire to women and inner city youth in Minneapolis/St. Paul. Born in Wisconsin, an expatriate in Europe in the 1980s, and living and teaching in Minnesota from 1992 to 1999, she is now based in Chicago and teaches students throughout the Midwest. She is a bilingual, published author with a PhD from the University of Illinois/Chicago and an M.A. from the University of Chicago. 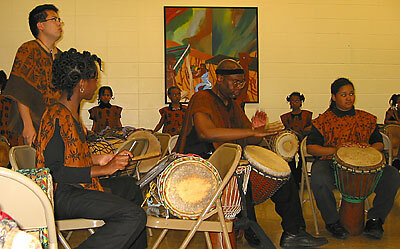 Jim performing with adult and youth students at Kennicott Park end-of-school-year recital in Chicago, 2004. Jim has dedicated himself to the djembe/dunun drumming tradition since 1996. He has studied and apprenticed with Lilian Friedberg since 1998 as co-founder of the Chicago Djembe Project, has studied intensively with Master Drummer Famoudou Konaté since 2000, and has also studied with Nansedy Keita, Master Drummer Mamady Keita, and Mahiri Keita. Famoudou designated Jim as his "official Sangbanfola" in the U.S. in 2003. 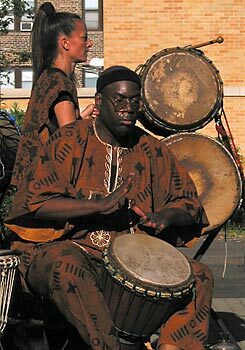 Jim was one of the original members of the Chicago djembe group Dahui, and has performed with Famoudou, Nansedy Keita and Sayon Camara as co-leader of the Chicago Djembe Project Ensemble. 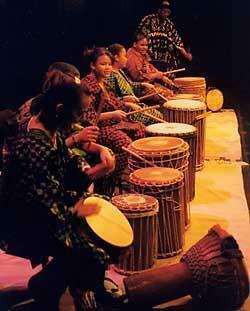 He brings high standards of professionalism to djembe teaching, performing, organization and promotion.